Born and raised to always help others, Katrin Betker is an inspiration to many. With May being Mental Health Awareness Month, Katrin shared many of her life struggles and how she maintained a positive outlook. While raising her twin boys, caring for her elderly mother at home, helping in the kitchen at Sojourn, along with volunteering at church camp every summer. Katrin continuously gives comfort and care to those around her. 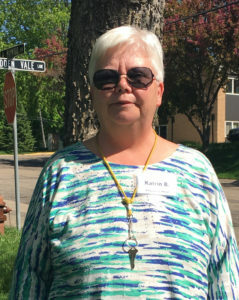 After Katrin’s father served in the Navy for 22 years, her parents moved their 7 children from Illinois to Minnesota. Along with her 3 brothers and 3 sisters, they attended school in Minnetonka. Growing up, Katrin struggled with a learning disability. She was bullied and often felt as though she was looked at differently. Her job as a single mom is challenging on many levels. Andrew has a cognitive learning disability and Aaron deals with Autism Spectrum Disorder. She also helps her 85-year-old mother who is recovering from 4 surgeries this past year. It has been a challenging road, but above all, Katrin values her loved-ones and looks forward to family meals when time and busy schedules align. She also enjoys attending church every Sunday with her mother at Mt. Calvary Lutheran in Excelsior. Katrin turns to her faith to help her through hard times. Every spring she finds time to volunteer at Luther Park Bible Camp in Dansbury, Wisconsin. “Luther Park is my getaway, my vacation. The people are wonderful and so inspiring.” Katrin’s passion truly is to help others and give back to the community. After losing her father to a heart attack and a brother in a car accident, she although sad, believes her faith is what keeps her going. When asked if she could give one word of advice to anyone going through a hard time, her answer was simple, “Don’t be afraid to ask for help. You can’t continue to help others if you don’t take care of yourself too. If you’re feeling like you can’t stop, and life is continuously throwing you curve balls, stop and just breathe,” stated Katrin. Life is short, and sometimes shorter than we expect. Don’t take the little things for granted. One day you will realize they were the big things. Spending time with family and loved ones is so precious; cherish it.